The Crescent Nebula (also known as NGC 6888, Caldwell 27, Sharpless 105) is an emission nebula in the constellation Cygnus, about 5000 light-years away from Earth. It was discovered by William Herschel in 1792. It is formed by the fast stellar wind from the Wolf-Rayet star WR 136 (HD 192163) colliding with and energizing the slower moving wind ejected by the star when it became a red giant around 250,000 to 400,000 years ago. The result of the collision is a shell and two shock waves, one moving outward and one moving inward. The inward moving shock wave heats the stellar wind to X-ray-emitting temperatures. Crescent Nebula in H-alpha and OIII. Imaged with a 715mm focal length telescope. The hydrogen gas is red. The oxygen is blue. Image of NGC 6888 using H-alpha filter. ^ a b c "NGC 6888". SIMBAD. Centre de données astronomiques de Strasbourg. Retrieved 2007-04-23. ^ Erdmann, Robert. "NGC 6888". The NGC/IC Project. Archived from the original on 2012-05-20. ^ "WR 136". jumk.de. Retrieved 25 March 2018. "Crescent". National Optical Astronomy Observatory. "Crescent Nebula: Live Fast, Blow Hard and Die Young". Chandra X-Ray Observatory. 14 October 2003. Nemiroff, R.; Bonnell, J., eds. (11 November 2007). 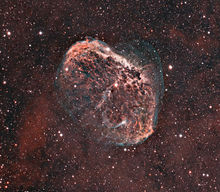 "NGC 6888: The Crescent Nebula". Astronomy Picture of the Day. NASA. Retrieved 25 March 2018. This page was last edited on 12 March 2019, at 21:26 (UTC).